The Royal Military College of Canada (French: Collège militaire royal du Canada), commonly abbreviated as RMC (CMR in French), is the military college of the Canadian Armed Forces, and is a degree-granting university training military officers. RMC was established in 1876 and is the only federal institution in Canada with degree-granting powers. The Royal Military College of Canada Degrees Act, 1959 empowers the college to confer degrees in arts, science, and engineering. Programs are offered at the undergraduate and graduate levels, both on campus as well as through the college's distance learning programme via the Division of Continuing Studies. Located on Point Frederick, a 41-hectare (101-acre) peninsula in Kingston, Ontario, the college is a mix of historic buildings and more modern academic, athletic, and dormitory facilities. Officer cadets of the Royal Military College of Canada are trained in what are known as the "four pillars" of academics, officership, athletics, and bilingualism. The Royal Military College of Canada prepares officer cadets for a career in the profession of arms and continues the development of other Canadian Armed Forces members and civilians with an interest in defence issues. RMC provides programs and courses of higher education and professional development to meet the needs of the Canadian Armed Forces and the Department of National Defence. The RMC mission is to educate, train and develop Officer Cadets for leadership careers of effective service in the Canadian Armed Forces – the Royal Canadian Air Force, the Royal Canadian Navy and the Canadian Army. For most students under the ROTP (Regular Officer Training Plan), education is free and a monthly salary is paid which meets incidentals. The courses are offered both on site and by distance learning in both official languages: English and French. After graduation, Officers are to give two months of service for each subsidized month of education. RMC offers 19 undergraduate programs in Arts, Science and Engineering. RMC offers 34 graduate studies opportunities, including 14 doctorates. In addition to the Faculty (university) of Arts, Engineering, and Science, the Division of Continuing Studies offers undergraduate and graduate level programs including the "Officer Professional Military Education" program (OPME). The Department of Applied Military Science (AMS) offers a graduate level program – the Land Force Technical Staff Programme (LFTSP) and an undergraduate/community college level program – the Army Technical Warrant Officer's Programme. All undergraduate students are required to complete the core curriculum, which is designed to provide a balanced liberal arts, science, and military education. The Core Curriculum consists of Economics, Psychology, Mathematics, English, Calculus, Military history of Canada, Chemistry, Canadian History, Physics and Civics. Tuition fees (2014–15) at the undergraduate level vary from $2,780 – $3,710 for Canadian undergraduate students and $2,780 – $3,165 for Canadian Graduate students. The tuition fees for international students vary from $8,750 – $9,000 for undergraduate students and $6,200 – $6,700 for graduate students. The lower tuition amounts are for the arts and sciences programs, while the higher amounts are for the engineering programs. Because of commitments of military service following graduation, education is free for most on-campus undergraduates; these Officer Cadets also receive an additional monthly salary. Funding has been put in place to support civilian students, who are eligible for admission to the master's and doctoral programs to work alongside graduate students who are members of the Canadian Armed Forces. The research at RMCC focusses on areas of direct and indirect benefit to the Department of National Defence; More than 90 percent of the research at RMC is defence-related. RMC conducts both academic and contracted research on electrical and computer engineering, physics, chemistry, chemical engineering and environmental engineering, civil engineering, mechanical engineering, international security, governance and the economics of defence; some research involves the Institute for the Environment as well as nuclear research. Both members of the Canadian Forces and civilian students are eligible for admission to the master's and doctoral programs; Funding has been put in place to support both military and civilian students. The Royal Language Centre of Canada teaches cadets how to communicate in both of Canada's official languages, English and French. The program begins with 4 placement tests. Students are placed into small classes and undergo 5 periods of instruction per week during regular school hours. Founded in September 1999, the Canadian Forces Leadership Institute (CFLI) at RMC teaches the philosophy of leadership and command. The Institute plays a role in the development of all Canadian Forces officers and Non Commissioned Members. The CFLI is a centre for multi-disciplinary research, analysis and lessons learned on leadership and professionalism in the armed forces and civil society. The Institute's civilian and military faculty in the social sciences and humanities ensure that academic theories, models and concepts guide military doctrine and reforms and share Canadian military concepts, policies and programs with the academic community, other government departments and foreign counterparts. Established in 1975, the mission is to conduct research in matters of national and international security and other aspects of international relations. The Centre has strong links with the RMC. Founded in 2001, the GeoEngineering Centre at Queens and the RMC mission is to innovate and advance knowledge in geotechnical, geohydrological, geochemical, geomechanical and geosynthetics engineering. The Centre has been housed on the first floor of Ellis Hall at Queen's University since July 2004. Led by Queen's University, the HPCVL mission is to provide supercomputer power to a number of universities in eastern Ontario: Queen's University, RMC, the University of Ottawa and Carleton University. Researchers are provided with the computational power needed to solve increasingly complex problems. The mission is to make available the most recent and relevant research results from the study of defence economics to Canadian defence policy analysis and decision-making. The Defence and Security Research Institute (DSRI) was created on 13 June 2008, at RMC. The DSRI is a defence and security centre within both the academic and defence and security science research communities. The Research Areas of Pursuit are: communications, energy, environment, materials, and security policy. The CIMVHR was created in 2010 at RMC and Queen's. The military and Veteran health research areas of pursuit are: battlefield medicine and surgery, epidemiology, infectious disease, collaborative health care teams, health technologies, health surveillance, Veterans’ health, mental health, military and veterans’ family health, occupational health, operational health, and rehabilitation. 2The CSAFS was founded in 2006 as a think tank with offices in the Department of Politics and Economics. Political and strategic research is delivered to clients such as the CEFCOM, J2, J3 and DRDC with deliverables ranging from publication, presentations and symposiums, to briefing notes, round table discussions and conferences. #1 squadron, stained glass spider, Stone Frigate, Royal Military College of Canada. The undergraduate student body, known as the Cadet Wing, is sub-divided into 13 (12 ROTP and 1 UTPNCM) squadrons of approximately 70 college cadets each. Each squadron is subdivided into three flights, with each flight further subdivided into three sections. The squadrons are led by senior cadets under the guidance of the squadron commander. Note: The dates given are for the current organization of the wing and does not include former squadrons or the same squadrons under different names. For example, 1 Squadron was the first squadron at RMC, meaning 1 squadron has existed since the College's founding in 1876, but has only been known as Hudson Squadron since 1948. In 2007, a former squadron of the Royal Military Colloge Saint-Jean, Jolliet Squadron, was stood up at RMC as 13 Squadron. The squadron was named in honour of Louis Jolliet, with its first-year flight, Good Flight, named after Herman James Good, a Victoria Cross recipient from the 13th Battalion, CEF. There are several full-time admission options for an education at RMCC. The Regular Officer Training Plan (ROTP) is a conditional scholarship offered to selected applicants. In addition to a university education, Officer Cadets receive military training, occupation training and second language training and a career after graduation. The full-time salary includes full dental care, as well as vacation with full pay. Upon successful completion of ROTP, Officer Cadets are awarded a university degree and granted commissions as Officers in the Canadian Forces. Normally, graduates serve at least five years with the Canadian Forces. The application deadline to ROTP is in January for Basic Officer Training in July and admission the following September. Typically, successful applicants enter the Canadian Military College (CMC) System as an Officer Cadet, where they receive an education that balances academics, leadership, bilingualism and athletics. If the choice of program is not offered, such as Nursing, Physiotherapy and Pharmacy, or the candidate wishes to attend another university, successful applicants would be eligible to apply to any Canadian university where books, lab fees and student fees are covered, and students receive a monthly salary under the Civilian University ROTP. The Reserve Entry Training Plan is an education that is the same as the ROTP but is paid for by the student (not a scholarship). The students also do not draw a salary, however they are not obligated to five years of service after completion. Reserve Entry cadets are, however, paid considerably more than the regular ROTP Officer Cadet salary during their summer training months. They are also entitled to this pay if they attend "Duty/Varsity" away trips (For example, an away game of women's soccer). UTPNCM: University Training Plan – Non Commissioned Members for Non Commissioned members of the Canadian Forces to earn a degree and then serve as officers. IBDP: Initial Baccalaureate Degree Program, a Baccalaureate program. Since an application to ROTP is also an application to the Canadian Military College System, all candidates are assessed against an aptitude test, a medical examination, and an interview. Military Potential is an assessment of Aptitudes, Personality Traits, and the choice of occupation. Academic Performance is rated based on a student's transcript. Unlike many universities, since a complete transcript is submitted to the selection board, grade 9-11 marks are heavily weighted in a student's application with consideration given to grade 12 (or the final year's) marks. Officer Cadets are obliged to maintain satisfactory academic and military performance throughout the programme. RMC started a graduate studies program in 1965. The Division of Continuing Studies was established in 1997. Master of Arts and PhD in War Studies. The Royal Military College of Canada launched its Artist-in-Residence program in January 2010 with Steven Heighton, a novelist and poet as the first to hold the post. The third person to hold the position, playwright Dr. Julie Salverson, presented "Drama, Imagination, and RMC" on 3 April 2012 in Currie Hall. Dr. Salverson, who has conducted drama workshops with cadets since the early 1990s, helped facilitate a play about RMC, "Shakespeare in Scarlets" in 2012. In 2014, the Artist-in-Residence was Gord Sinclair of The Tragically Hip, who put together a concert on the parade square where cadets, staff, and faculty performed for their peers at an event dubbed Bruciepalooza. Both The Trews and guitarist Rob Baker of The Tragically Hip made unexpected guest appearances to perform for the College. Kingston photographer Chris Miner held the position throughout the 2014–15 academic year, culminating in a gallery exhibition of his work along with winning photographs by students, staff, and faculty submitted as part of the Photo Op 2015 photography contest. In the winter term of the 2015–2016 academic year, Canadian novelist and poet Helen Humphreys was the Artist-in-Residence, and held weekly workshops on novel writing and poetry. The RMC Centre for Security, Armed Forces and Society (CSAS-CESFAS) provides a focus for research conducted within the Faculty of Arts and facilitates communication between the Department of National Defence, other research institutions, scholars and Canadian civil society. the Technical Warrant Officer Programme (warrant officers & master warrant officers). The Diploma in Military Arts and Sciences (DMASc) provides non-commissioned members (NCMs) of the Canadian Forces an online program made possible by a partnership between OntarioLearn, the RMC, and the Canadian Defence Academy. Under RMC and community college articulation agreements, all graduates of this diploma program who apply to the RMC will be admitted into the Bachelor of Military Arts and Sciences degree program with advanced standing. As an RMC cadet, military training begins with Basic Military Officer Qualification (BMOQ) in the summer prior to first year and prior to second year at the Canadian Forces Leadership and Recruit School Saint-Jean. After the completion of BMOQ, those cadets who are not yet bilingual are usually enrolled in a seven-week period of Second Language Training (SLT) at Canadian Forces Language School Detachment Saint-Jean, or may remain in Kingston to study a second official language. The remaining summers are spent doing various other training depending on the specific elements or occupations of each cadet. First Year Orientation Period, (FYOP) is the most demanding challenge many cadets will face during their time at the college. FYOP takes place during the first month of the academic year following the completion of the first mod of BMOQ. Prior to the 2015-2016 academic year, cadets would attend 2 week program called recruit camp in which cadets would undergo some basic military training before entering the college. With newly hired cadets completing half of their BMOQ before attending RMC, recruit camp is no longer necessary. FYOP is like Frosh week at civilian universities, except it lasts three weeks and cadets are placed under extreme stress for nearly the entire duration. FYOP begins with the Arch parade where the entire First Year class is marched onto College grounds by their FYOP staff consisting of Third and Fourth Years. The culmination of the FYOP is the obstacle course. The obstacle course lasts over 2 hours and consists of twelve obstacles built by each squadron located around the college grounds. Obstacles such as a 12-foot wall and rope bridge are designed to test teamwork and physical fitness of First Years. The First Year flights are judged on the time it takes to complete each obstacle. The completion of the obstacle course signals the end of FYOP. Afterwards, First Years are given a parade where they are officially welcomed into RMC and join the Cadet Wing. Cadets are then allowed to see their friends and relatives, and are allowed the freedom to leave college grounds. In previous years cadets were required to wear their College uniform when leaving the college grounds, but as of 2017 this rule has been modified; cadets can now wear civilian business casual clothes. When attending formal events, the college uniform worn is the number 4s. This form of dress consists of dark blue pants with a red stripe down the side and a dark blue tunic. Badges can be put on both arms once earned. The year is also represented on the lower arms by red ribbon; however, second year is the first to have any red ribbon. Second year cadets, in RMC's academic mentorship program, are paired with first year cadets as "academic parents" to mentor, guide, and influence them during their study at the college. This program, however, relies entirely on the second year cadet's following through on their due diligence to mentor their "academic children", as there is almost no staff (commissioned officer / non-commissioned member) oversight over the ongoings of either the FYOP or academic mentorship program, outside of general rule-making. Many of the aspects of the FYOP, including the obstacle course and mentorship program, were developed by the post-war Chesley committee, led by Brigadier Leonard McEwan Chelsey, O.B.E., E.D. The committee made recommendations about the education and training of officer candidates for the postwar active force. In addition, the committee made recommendations about the provision of French speaking officers and arrangements for promotion from the ranks. The Military Law Centre on the grounds of RMC, staffed with 12 military lawyers, oversees the education of officers and troops in legal matters ranging from the Forces' own code of conduct to the laws of war. It trains military lawyers and advises Ottawa on matters of policy and doctrine. The centre integrates legal education into the regular training that Forces members undergo and establishes its growing importance within the military hierarchy. Selected RMC Canada cadets participate in Law of Armed Conflict international Competitions each fall with cadets from USAFA, USMA, USNA, and USCGA. Each year, RMC cadets are selected to participate in a competition on the Law of Armed Conflict at the International Institute of Humanitarian Law in Sanremo, Italy. One of the four components of the Royal Military College of Canada, the Athletic component provides opportunities for officer cadets to participate in physical activities and sports that are mentally demanding to develop their physical capabilities, confidence and leadership. Physical education is meant "to establish a strong foundation of skills and knowledge in physical fitness, sports, and military-related activities through a progressive and diverse physical education program for RMC Officer Cadets" The Vision is "foster a passion for active living and leadership in physical activity." To enhance their physical fitness and develop military and athletic skills necessary to lead their troops, Cadets must take physical education classes and play intramural sports every year – for a minimum of four hours per week. The Massed Band, consisting of the Brass and Reed, Pipes and Drums, and Highland Dancers, perform at parades, public relation trips and recruit shows. The Brass and Reed Band is a multi-purpose section, used primarily as a parade march and concert band. The Pipe Section and the Drum Section perform at mess dinners; parades; sporting events; ceremonies (official or squadron); weddings; funerals; public relations; wing events; Christmas Ball (RMC) & Graduation Balls; private events; and holidays. The Highland Dance Section perform at many of the same functions with the exception of parades and funerals. The Choir performs the Canadian national anthem; sings at mess dinners; and accompanies the Stage Band on selected pieces including: folk, jazz, traditional music, French music, show tunes, African music and Christmas songs. The Stage Band is versatile, performing dinner music followed by marches at college mess dinners. The Cheer Band, a subsidiary of the Brass and Reed, performs music for RMC sporting events, such as the Carr-Harris Cup and the Westpoint Weekend. RMC is located on Point Frederick (Kingston, Ontario), a small peninsula at the point where the St. Lawrence River leaves Lake Ontario and where the Rideau Canal system starts. The location has been an active military base since 1789 and the Kingston Royal Naval Dockyard, located on the site, was an important dockyard during the War of 1812. RMC, the first officer training college in Canada, opened in 1876 with 18 cadets receiving military and academic instruction. It was granted university status in 1959. The Stone Frigate, a large stone building completed in 1820 by Sir Robert Barrie, was designed to hold gear and rigging from British warships dismantled in compliance with the Rush–Bagot Treaty. It served as a barracks briefly in 1837–38, and was refitted as a dormitory and classrooms to house RMC by 1876. During the Great Depression in Canada of the 1930s, an unemployment relief camp on Barriefield lower common was set up under the command of the RMC Commandant. Public works projects relied on the labour of the 'Royal Twenty Centres' supplied by the under the Unemployment Relief Commission. The public works projects included rebuilding the dry stone wall and moat of Fort Frederick; the physics building extension, the connection from the Fort Frederick dormitory to the new Yeo mess building, the new wing of the hospital, a new garage, road work, levelling the grounds at RMC for new football fields and a new running track. The cornerstone of Yeo Hall was laid in 1934 by the Earl of Bessborough, HE The Gov Gen. Yeo Hall was opened in 1936. The Officers' Mess was moved in 1960 to the Senior Staff Mess at which point 'Bill & Alfie's' became a recreational space for Senior Cadets. There were renovations to Fort LaSalle dormitory and Yeo Hall between 1993–1995 to accommodate the closure of the other two colleges. In 1997, there were additions to the Dining Room, and an extension for the kitchen and servery above which is the Cadet Mess at Yeo Hall. The nominations for honorary degrees by the Royal Military Colleges can be initiated by different organizations or individuals, including the Royal Military Colleges Club of Canada through any member of the college senate. As with most of Canadian universities, the senate, which in the case of RMC is composed of the Chancellor (Minister of National Defence), the Vice Chancellor (The RMCC Commandant), Principal, Deans, DCadet, Registrar and the Directeur des Etudes du Royal Military College Saint-Jean, makes the final decision. The Royal Military Colleges Club of Canada (RMCCC) has no responsibility or authority in the process of granting honorary degrees. Cadets wear a variety of uniforms depending on the occasion and their environment: ceremonial dress (semi ceremonial); full dress (formal occasions); outside sports dress; service dress Air Force; service dress Navy; service dress Navy without jacket; Service dress Air Force without jacket; service dress Army without jacket; and combat dress. In winter 2009, Royal Military College officer cadets returned to wearing a distinctive Dress of the Day (DOD) uniform which consists of a white shirt, black sweater/light jacket, as well as black trousers/skirt with a red stripe down the side. The headdress is a black wedge with red piping. Mess dress is worn in the Senior Staff Mess for formal occasions such as mess dinners. The RMC Cadet Mess in Yeo Hall has facilities for social and recreational activities. Staff and faculty have access to the Senior Staff Mess. Both Royal Military College of Canada chapels serving Roman Catholic, Protestant and Muslim communities are located in Yeo Hall. The Baronial Hall or Currie Hall, which was designed in 1922 by Percy Erskine Nobbs to honour the Canadian Expeditionary Force in World War I play a prominent role in the life of the University. During special events, invited speakers and dignitaries may address the University population or general public from the Great Hall. Many conferences held in Kingston, Ontario may book the halls for lectures or presentations. The CANEX is a small retail store in Yeo Hall for personal articles, souvenirs, snacks and dry cleaning. Bill & Alphie's, the on-campus cadet mess in Yeo Hall, is named after Bruce Bairnsfather's Great War cartoon characters. Old Bill & little Alphie, stone carvings based on two World War I cartoon characters by Bruce Bairnsfather, appear at the entrance to RMC's Yeo Hall. The campus is on the shore of Lake Ontario and has easy access to two lake-front parks, favourite locations for students to relax. The campus is also located approximately 10 minutes' walk from the city's downtown. Cadets are obligated to perform community service. Every year there is a mandatory class project. The first year class project has cadets conduct an event for the "underprivileged" youth of the city. The second year class project has cadets conduct a food drive for the city's food bank. The third year class project has cadets perform upkeep on the city's many parks. The fourth year class project has the class project leader raise money for a charity through the conduct of a fundraiser which usually takes the form of a baseball tournament. The student clubs and organizations associated with the RMC include: Arts, Astronomy, Broomball, Cheerleading, Chess, Climbing, Cycling, Debating, drama, Duke of Edinburgh's Award, Expedition, Fish & Game, Flying, golf, Judo, Juggling, Outdoors, Paintball, Photo, rowing, Social Dance, Stage Band, Triathlon/Running, Video Editing, War Games, Water Polo, Windsurfing, Women's Rugby and Yachting. The RMC Drama Club performed a tongue-in-cheek look at the college fraternization policy "Shakespeare in Scarlets," at Currie Hall in March 2012 with cadets serving as actors, writers, director, and tech crew. The Royal Military Colleges of Canada Foundation is a registered Canadian charity which was incorporated in 1966. As an element of the Canadian Forces, the college is unable to fund a conventional full-time fundraising team in a development office. The foundation, consequently, works at arms length to assist the college financially. Capital Campaigns have included the 2364 Leonard Birchall Pavilion (2007); Memorial Arch Restoration (2001) and the New Library Campaign (2013). RMC cadets once produced the campus newspaper, the Precision, however this does not exist anymore. The alumni association produces Veritas and e-Veritas. "Can you dig it?" a week-long archaeology summer camp. Summer athletic and fencing camps at RMC include: RMC Soccer Camp "Kingston Kicks"; RMC Fencing High Performance Training Camp; RMC Super Summer Sports Camp; RMC Pirate Camp; RMC Volleyball Camp. The Chief Dominion Architect(s) designed a number of public buildings at the College: Thomas Seaton Scott (1872–1881); Thomas Fuller (architect) (1881–1896); David Ewart (1896–1914); Edgar Lewis Horwood (1914–1917); Richard Cotsman Wright (1918–1927); Thomas W. Fuller (1927–1936), Charles D. Sutherland (1936–1947) and Joseph Charles Gustave Brault (1947–1952). Thomas Seaton Scott and Thomas Fuller adopted the Neo-Gothic style. David Ewart embraced the Baronial style. Richard Cotsman Wright (1918–1927) adopted the Collegiate Gothic style. two large landscape paintings of the Rocky Mountains in the lounge have plaques indicating that they were presented by ex-cadets in memory of the times spent with their former drawing instructor, Forshaw Day. One is entitled "On the Bow" whilst the other is untitled. The Royal Military College of Canada Libraries is a member of the Ontario Council of University Libraries and is a contributor to Open Content Alliance. RMC has six dormitories, which are similar to most universities and provide the basic necessities. Organized by squadron, dormitories are co-educational with separate washrooms for men and women. Officer Cadets share a room in first year, and sometimes in succeeding years depending on availability of space, if possible with someone who is proficient in the other official language. The oldest, the Stone Frigate was built in 1819–20 and is a Canadian Heritage Site. The Stone Frigate, known within the college as "The Boat" houses 1 Squadron who in turn call themselves the Stone Frigate Military Academy. The next building built Fort Lasalle holds 7, 8, and 9 squadron while the third building, Fort Haldimand hosts 11 and 12 Squadron. Fort Champlain (1965) accommodates the Cadet Wing Headquarters and 2 and 3 Squadron. Fort Sauve (2001) houses 4, 5, and 6 Squadron and the newest dormitory, Fort Brant (2011) aka "The Greenhouse" houses ALOY and 10 squadron. Fort Brant was called such due to the overheating problems experienced by the massive glass facade which by facing south traps a large amount of solar heat which is then circulated throughout the building. In honour of Remembrance Day, 2012 students in Dr Erika Behrisch Elce's first-year English for science and engineering students wrote a sonnet on behalf of one of those connected with Royal Military College of Canada who died doing his or her duty. A printed collection will also soon be available through the College Library for general distribution. Response: Beer! Esses! Emma! T-D-V! Who can stop old RMC! Having three national historical designations, environmental assessments (which also involve archaeological studies) are required before construction activities are implemented on the college grounds. While planning to build a new dormitory at RMC, a required environmental assessment revealed the remains of a naval dockyard. This dockyard was significant in the building of ships by the British during the War of 1812. Because of the site's significance, a full archaeological dig had to be implemented before construction of the new dormitory could begin. Long before the Royal Military College was established in 1876, there were proposals for military colleges in Canada. Although the Assembly of Lower Canada decided to establish a military college in 1815, agreement upon its organization was blocked by religious and racial conflicts. Captain A.G. Douglas, a former adjutant at the British military college at Great Marlow, recommended in 1816 the establishment of a military college open to Catholic and Protestant boys at Three Rivers in a disused government house with himself as superintendent. Douglas' college was intended as a boarding school to educate the young sons of officers, amongst others, in Latin, English language, French Language, History, Geography, Drawing and Mathematics. In 1826, retired British navy and army officers who had settled in March township, near Ottawa, Ontario proposed a military college boarding school for boys on the Great Lakes on naval and military lines. Staffed by British Regulars, the adult male students underwent a 3-month-long military course in Toronto, Ontario and Quebec, Quebec in 1864, and at Montreal, Quebec Kingston, Ontario London, Ontario and Hamilton, Ontario in 1865. The School of Military Instruction in Kingston was established by Militia General Order of 10 February 1865 for the purpose of enabling Officers of Militia or Candidates for Commission or promotion in the Militia to perfect themselves in a knowledge of their Military duties, drill and discipline. The Commandant certified that a cadet from a particular Regimental Division attended said School of Military Instruction and had proven himself to his satisfaction able to command a Company at Battalion Drill, to Drill a Company at Company Drill and that he has acquired a complete acquaintance with the internal economy of a Company and the duties of a Company's Officer and that he is qualified under the provisions of the said General Order to hold either a First or Second Class Certificate. Although the military colleges in London and Hamilton had disbanded in 1865, the schools at Quebec, Montreal, Kingston and Toronto were retained at Confederation, in 1867. In 1868, schools of Cavalry and Artillery were formed in Toronto and a school of artillery was formed in Montreal. Since these were not Boarding schools, students lived in the communities. At a pre-Confederation of Canada military school in Halifax, Nova Scotia, adult male students drilled and attended lectures on drill commands, military records, court-martial, the Articles of War, discipline and punishments, promotion of non commissioned officers, military accounts and pay and messing. After Confederation, military schools were opened in Halifax and Saint John. In 1870–1, Canadian militia staff replaced the British regulars who were recalled from overseas station. From December to May, six schools conducted officer training for cavalry, infantry and artillery. The British Garrisons operated the schools at Halifax, Saint John, New Brunswick and Quebec. Canadian militia staff and former British army drill sergeants operated the schools at Montreal, Kingston and Toronto. The first full-time units of the Canadian militia, A and B Batteries at Kingston and Quebec, organized gunnery schools on a year-round basis in which artillery courses lasted from 3–12 months with the possibility of extension. Colonel P Robertson-Ross, adjutant general of the militia (1870–3) recommended the schools be organized as tactical brigades of three arms and that infantry and cavalry schools should also be put on a permanent basis. The Canadian government did not accept his advice. A plaque located at the college describes the college's history: "Following the withdrawal of British forces from Canada in 1870–71, the federal government recognized the need for an officer training college in Canada. In 1874, during the administration of the Hon. Alexander Mackenzie, enabling legislation was passed. Located on Point Frederick, the site of the former Royal Naval Dockyard, the new college opened on June 1, 1876, with 18 cadets under Lt.-Col. Edward O. Hewett, R.E. Named the Royal Military College of Canada in 1878, it offered academic and military training courses designed to prepare cadets for both military and civil careers. The college was reorganized in 1948 as a tri-service institution and, in 1959, it became the first military college in the British Commonwealth to achieve degree-granting status." The Royal Military College of Canada "was the first military college to be established in a colonial dependency and it had a double function, the preparation of cadets for civilian careers as well as for military commissions." Richard A Preston, Canada's RMC. The Kingston Royal Naval Dockyard was a Royal Navy yard from 1788 to 1853 at the site of the current Royal Military College of Canada. The first college Commandant, Lieut. Colonel Hewett, made the first public announcement of the college motto and ‘device’ (badge) during a prize presentation held at the Kingston Military College on 11 February 1878. "I now have to tell you Gentlemen Cadets, that a device and motto has been selected for the Military College. The device, a mailed arm bearing a maple leaf; symbolical of the position you, as the future officers of Canada, should hold towards your country as represented by the maple leaf. The motto, "Truth, Duty, and Valour,"- three simple words in plain English -that all who run may read." These words by Professor Robert Carr Harris, RMC's first Professor of Engineering, were recalled when his son No. 1118 Major G. G. M. Carr-Harris unveiled a plaque in the entrance to the Currie Building in 1964 to the memory of his father "Engineering, leads a man among actions, thoughts, and associations which are useful and honourable, and a life so spent will leave its mark upon anyone's character." The Harris memorial plaque is alongside one commemorating the first Commandant Major Edward Osborne Hewett who chose the college motto, "Truth, Duty, Valour". The Hewett plaque is alongside one commemorating the first Staff Adjutant Major Raymond N.R. Reade, a British officer sent to the RMC from London in 1901, who authorized construction of a gymnasium, a hospital, an electrical plant, and a permanent accommodation for the staff-adjutant and his family. Military College of Canada in Kingston, Ontario opened its doors to the first class of eighteen officer cadets. The names of these "Old Eighteen" are memorized by all cadets today. Queen Victoria granted the college the right to use the prefix "Royal." The first Commandant, Major Edward Osborne Hewett, chose the college motto, "Truth, Duty, Valour". The full dress uniform of an officer cadet has remained essentially the same; however, the Pillbox hat has replaced the shako. The pith helmet remains in use for Parade (military) only. Private schools were established to prepare boys for entrance to RMC, including the Rothesay Netherwood School and the Hillfield Strathallan College. A House of Commons report describes "Kingston Military College and other Educational Experiments ... The Government of the Dominion have also established, at Kingston, an institution where young men may receive a training to fit them for the military profession—an institution something on the model of West Point—the practical benefits of which, however, are not as yet appreciable in a country like this, which has no regular army, and cannot afford employment suitable for the peculiar studies necessarily followed in the Academy." RMC certificates of graduation, first or second class, were replaced by RMC diplomas of graduation with or without honours. This distinguished RMC graduates from militia holders of drill certificates issued by a school of artillery. Hockey game played between students of Queen's University and the Royal Military College of Canada. 194 LCol Edward Theodore Barclay Gillmore composed ‘The R.M.C. waltzes for piano [music]‘ dedicated to the Gentlemen Cadets of the Royal Military College of Canada, which was published by A. & S. Nordheimer in 1891. The R.M.C. march & two step for piano dedicated to the Cadets of the Royal Military College, Kingston by Jessie Campbell Taylor published by the National Litho. Co., c. 1900 in Toronto. 200 men undertook a seven-day, highly competitive examination for the 53 positions at the Royal Military College in the year following the outbreak of the Great War. Cadets completed an intensive wartime one-year course. The RMC club decided to erect "a suitable memorial gateway" in memory of those ex cadets who have laid down their lives…." His Royal Highness the Prince of Wales presented RMC with colours. "Per pale Azure and Gules on the Dexter side a Scaling Ladder Argent ensigned by a Mural Crown Or and on the Sinister side two Swords in saltire of the third points upward, on a Chief of the fourth three grenades of the first fired proper, an Inescutcheon charged with the Union Badge and for the Crest on a Wreath of the Colours An Arm in armour embowed gauntletted and holding a Sprig of three Maple Leaves and ensigned by the Imperial Crown all proper, as the same are in the painting hereunto annexed more plainly depicted to be borne by our said Royal Military College of Canada on Seals, Shields, Banners, Flags or otherwise according to the Laws of Arms." During the Great Depression in Canada of the 1930s, a military-run and -styled relief camp on Barriefield lower common was set up under the command of the RMC Commandant. Extensive public works projects at the College relied on the labour of single unemployed men, the 'Royal Twenty Centres' supplied by the Unemployment Relief Commission. "Precision" (1933) film by The Associated Screen News Ltd. is "A sample look at discipline at the Royal Military College. The emphasis is on precision gymnastics displays, ceremonial battalion marches in full uniform, and the changing of the sentry demonstrated by gentlemen cadets of the College. Seen is the exterior of the RMC buildings (the Stone Frigate)." The last class at RMC for the duration of hostilities graduated, a final parade was held and the college colours were laid up in St. George's Cathedral (Kingston, Ontario). For the remainder of the war the College served as a wartime training area, offering courses such as the Company Commanders Course, Military Intelligence Course, and the War Staff Course. The Canadian Amateur Hockey Association declared Kingston, Ontario the birthplace of ice hockey, based on a recorded 1886 game played between students of Queen's University and the Royal Military College of Canada. The Chelsey committee, headed by Brigadier Leonard McEwan Chelsey (RMC 1917), made recommendations about the provision of officers for the active force, about the educational requiresments of candidates, and about the way they should be trained. Plan A proposed to eliminate RMC as a source of officers and to use the site as a two-year course for military training of university graduates. *Plan B proposed to enlarge RMC so it could provide the total annual requirements of the active force, to make it free and to impose an obligation on graduates to serve in the active force. Plan C proposed to enlarge RMC to produce 50–70% of the officers needed and to have a parallel officer training system in universities to prepare the balance. Emily Warren's two large canvasses 6′6″ x 11′6″, entitled "Canada's Tribute," which were initially hung in the Parliament Buildings are hung in the Sir Arthur Currie Hall at RMC. RMC reopened with the "New One Hundred" cadets. The New One Hundred Opening Ceremonies were held (20 September 1948). Since World War II, RMC has broadened to cover a wide range of disciplines however RMC was originally oriented very heavily towards science and engineering. The RMC Club commemorated the fallen from the Second World War on two bronze plaques located on the flanking plinths of the Arch. Names of cadets lost in Korea, through peacekeeping and other operations were added as required. The Old Brigade, alumni celebrating 50 + years since they entered one of the military colleges, are inducted. At the time, RMC was the only military college with a four-year course, the course was 15 percent military content. He devised a new system of organization at RMC consisting of a vice-commandant as director of studies, to coordinate the military and academic training at RMC and to represent RMC at the National Conference of Canadian Universities as the equivalent of a vce-principal. The commandant personally commanded the cadet battalion. A staff-adjutant issued the routine orders. The Royal Highness Princess Elizabeth and the Duke of Edinburgh visit RMC on 12 October 1951. The RMC MkI submarine, which was 20 feet long with a 6-foot beam, and weighed 7200 pounds, was launched. In 2000 divers found the sub, which had been sunk in Navy Bay. The RMC Band was founded. It includes the pipes and drums section, the brass and reed section, the choir, and a Scottish highland dance troupe. The province of Ontario granted a university charter to RMC by passing "The Royal Military College of Canada Degrees Act, 1959" enabling RMC to offer degrees in Arts, Science, and Engineering at the undergraduate and graduate levels. "The Royal Military College of Canada Degrees Act, 1959" was passed by the 25th Ontario Legislature and given Royal Assent on 26 March 1959. The Canadian historian, #4393 Doctor Desmond Morton O.C., was the first graduate of the Royal Military College of Canada to receive a degree from the military college. Previously, cadets transferred for their final year to a civilian university, where they earned a degree. His Excellency the Governor-General presented the RMC colours in June 1961 and took the salute on the marchpast. In March 1964, while viewing the College Flag atop Mackenzie Building, Col the Hon. George F.G. Stanley, then Dean of Arts RMC, first suggested to Col. the Hon. J.R. Matheson, then MP for Leeds, that the RMC College Flag should form the basis of the Canadian flag. The two collaborated on a design which was ultimately approved by Parliament and by Royal Proclamation adopted as the National Flag of Canada as of 15 February 1965. – a registered Canadian charity – was founded as an alumni charitable organization to perform fundraising in support of RMC. Over 500 cadets trooped the colours on Parliament Hill in honour of the centennial of the Confederation of Canada, with the troops being reviewed by the Governor-General. RMC celebrates the centennial of its opening. The Cadet Wing parades on Parliament Hill on 1 July in honour of that milestone. RMC graduates its largest class to date (200 cadets). Commemorative Centennial Franklin Mint Canada Ltd. silver coins depict a Gentleman Cadet holding a sword; the college's coat of arms with its motto "Truth, Duty, Valour"; the Memorial Arch erected in 1923 in memory of the Gentlemen Cadets who died in action in World War I; and Fort Frederick Tower, built in the mid-19th century, which houses the RMC Museum. 490 Brigadier F. H. Maynard (RMC 1901) unveiled the RMC Club's centennial gift, the statue Truth Duty Valour (1976) by William McElcheran now known as ‘Brucie.’ Maynard had served in France, Mesopotamia and India. Military colleges open their doors to women with the admission of UTPNCM female officer cadets and post graduate students. RMC has operated SLOWPOKE reactor research facility (nominal reactor power of 20 kW) in Kingston, Ontario since 1985. A Neutron Beam Tube (NBT) was added in February 1999 to the SLOWPOKE-2 facility for radioscopy and tomography operations (2-dimensional and 3-dimensional non-destructive imaging techniques). RMC's non-power reactor operating licence was renewed and will be valid from 1 July 2013, until 30 June 2023. In June 1991, the Regimental Colour of The Royal Military College of Canada was approved. Vol. IV, p. 181. A special convocation was held to award degrees to all who graduated from RMC before it could grant degrees. 1800 Senator Hartland Molson (RMC 1924) was in attendance. CMR now operates as part of ASU Saint-Jean as Campus Saint-Jean where preparatory year ("Prep year") cadets acquire the necessary academic standard needed to attend RMC. RRMC Royal Roads Military College is no longer a military institution, and is now maintained by the Government of British Columbia as Royal Roads University. RMC Board of Governors, which provides advice and recommendations to the Minister of National Defence concerning all matters related to RMC, was established. To commemorate the 125th anniversary of the founding of RMC, the RMC Foundation refurbished the Memorial Arch and the Royal Canadian Mint issued a 5-cent coin. The Canadian War Museum exhibition "Truth, Duty, Valour: The Royal Military College of Canada, 1876–2000" celebrates the institution's 125th anniversary. The RMC's Queen's Colour (flag) and Regimental Colour (flag) were registered with the Canadian Heraldic Authority on 1 June 2001. $100 Dollar Gold Royal Canadian Mint ice hockey coins commemorate the 75th Anniversary of the longest international hockey series – Royal Military College of Canada vs Westpoint hockey classic; the artist was Tony Bianco. For every 2.5 undergraduate degrees, RMC now produces one graduate degree. The average civilian faculty member at RMC currently attracts over $121,000 annually in extramural research funding. RMCC launched its writer in residence program. 31 paintings of Canadian war memorials by F.A. (Tex) Dawson were unveiled outside Currie Hall in the Mackenzie Building on 7 April 2010. The RMC launches its first Multicultural Day, promoting the culture and traditions of the Republic of Korea (ROK). Owing to Federal Government budget cuts, approximately 40 – 50 Faculty and support staff positions will disappear at RMC & RMC St Jean between 2012–2015. Ministerial approval to allow RMCC to admit civilian students under the Project Hero, a scholarship program for the children of Canadian Forces personnel killed while on active military duty. In Jetstream, a 2007 television series airing on Discovery Canada about pilots training to fly the CF-18 Hornet in the Canadian Forces, seven of the eight pilots are graduates of the RMC. Timothy Findley's fictional character Robert Ross in his World War I novel ‘the Wars’ (Penguin Canada 2005) studied military law and trajectory mathematics at the Royal Military College of Canada. His novel won the Governor General's Award for fiction and was adapted into a play. In 1985, Timothy Findlay was appointed an Officer of the Order of Canada. 1982 John-James Ford's protagonist in his coming-of-age novel Bonk on the Head studied at the Royal Military College of Canada. The novel won the 2006 Ottawa Book Award in the English fiction category. "Till we meet again", is a musical set in Montreal, Quebec during World War II. Each act features an interview with an ex Royal Military College of Canada cadet who is a Canadian army officer: after Dunkirk, after Dieppe and after Juno Beach. Sara Jeanette Duncan's "Cousin Cinderella: A Canadian Girl in London" by Macmillan in New York and Methuen in London (1908) features Graham, a Royal Military College of Canada graduate, and his sister Mary Trent. Graham and Mary's father, Senator Trent has earned a fortune in the family lumber business. After serving in South Africa and entering the family lumber business Graham Trent travels with his sister Mary from Minnebiac, a fictional small town in Ontario to England. There, Graham Trent becomes engaged to Barbara Pavisay, a member of a proud old English family whose line extends back to the Tudors. When Barbara Pavisay breaks off the engagement to Graham, his sister Mary becomes engaged to Barbara's brother Lord Pavisay. It is assumed that Graham Trent will return to Canada, continue in the family business and be elected to Parliament. Sara Jeanette Duncan's "A Voyage of Consolation" is a sequel to "Cousin Cinderella: A Canadian Girl in London." Dr. David Clark's Canadian Army Trilogy, The Ridge (1994), Lamone (2001) and Lucifer's Gate 2002 outlines the stories of two generations of the Warwick family and the Canadian Army in World War I. In Lucifer's Gate, Captain James Niles, a Royal Military College graduate, is posted temporarily to a recruit training battalion. He is a professional officer, all spit and polish, everything by the King's Regulations. After ordering the crowd to disperse, Niles accepts thanks from German proprietors of a tailor shop, Hans and Analise Holzhauer and falls for their daughter, Rosamund. The lovely Rosamund is unfortunately, an unsuitable match since they are worlds apart in social position. Niles, who is practically engaged to the Colonel's daughter Roselyn, comes to realize while serving under General Arthur Currie in France, that Roselyn never has a serious thought, caring only about tennis and garden parties. For a more comprehensive list, see List of Royal Military College of Canada people. ^ a b "The Royal Military College of Canada Degrees Act, 1959". Rmc.ca. 3 July 2014. Retrieved 9 July 2014. ^ "The Commandant". Royal Military College of Canada. Retrieved 13 March 2019. ^ a b "Royal Military College of Canada". University Study. Retrieved 31 May 2015. ^ "Station info for VE3RMC – Google Maps APRS". aprs.fi. Archived from the original on 27 September 2016. Retrieved 25 September 2016. ^ "RMC Campus @ Royal Military College of". Rmc.ca. 8 January 2009. Archived from the original on 10 September 2012. Retrieved 31 October 2011. ^ "RMC undergraduate Studies". Rmc.ca. 6 October 2011. Retrieved 31 October 2011. ^ "RMC Graduate Studies". Rmc.ca. 15 September 2011. Retrieved 31 October 2011. ^ "Aeronautical Engineering". Rmc.ca. 29 October 2010. Archived from the original on 10 September 2012. Retrieved 22 February 2011. ^ "Chemistry & Chemical Engineering". Rmc.ca. 6 October 2011. Retrieved 31 October 2011. ^ "Civil Engineering". Rmc.ca. 8 January 2009. Archived from the original on 15 January 2013. Retrieved 31 October 2011. ^ "Electrical Engineering". Rmc.ca. 28 September 2011. Retrieved 31 October 2011. ^ "Computer Engineering". Rmc.ca. 28 September 2011. Retrieved 31 October 2011. ^ "Mechanical Engineering". Rmc.ca. 29 October 2010. Archived from the original on 10 September 2012. Retrieved 31 October 2011. ^ "English". Rmc.ca. Retrieved 31 October 2011. ^ "History". Rmc.ca. 8 January 2009. Retrieved 31 October 2011. ^ "French". Rmc.ca. Retrieved 31 October 2011. ^ "politics and Economics". Rmc.ca. 8 January 2009. Retrieved 31 October 2011. ^ "Military and Strategic Studies". Rmc.ca. 8 January 2009. Retrieved 31 October 2011. ^ "Business Administration". Rmc.ca. 29 September 2009. Retrieved 31 October 2011. ^ "Military Psychology and Leadership". Rmc.ca. 8 January 2009. Retrieved 31 October 2011. ^ "Department of Mathematics and Computer Science of the Royal Military College of Canada". Rmc.ca. 8 January 2009. Retrieved 31 October 2011. ^ "Computer Science". Rmc.ca. 8 January 2009. Retrieved 31 October 2011. ^ "Physics". Rmc.ca. 18 April 2011. Retrieved 31 October 2011. ^ "Chemistry". Rmc.ca. 6 October 2011. Retrieved 31 October 2011. ^ "Space Science". Rmc.ca. 18 April 2011. Retrieved 31 October 2011. ^ "Centre for Space Research at RMC". Retrieved 31 May 2015. ^ "RMCC – Office of the Dean – Graduate Studies and Research – Royal Military College of Canada". Rmc.ca. 15 September 2011. Retrieved 31 October 2011. ^ "RMCC Academic Fees". rmc.ca. 2014. Retrieved 5 August 2014. ^ "Regular Officer Training Plan (ROTP) – Reserve Entry Training Plan (RETP)". rmc.ca. 2014. Retrieved 5 August 2014. ^ "Royal Military College of Canada – Universities Canada". Archived from the original on 30 April 2014. Retrieved 31 May 2015. ^ "Headquarters". forces.gc.ca. Archived from the original on 15 June 2008. Retrieved 25 September 2016. ^ "Officer education and training – planning for the future – Withers' Report – Board of Governors of the Royal Military College of Canada". Rmc.ca. Retrieved 31 October 2011. ^ "Events, New Releases & Announcements | Queen's Centre for International Relations". Queensu.ca. Archived from the original on 26 March 2011. Retrieved 22 February 2011. ^ "Centre for Space Research of the Royal Military College of Canada". Rmc.ca. 25 August 2009. Retrieved 31 October 2011. ^ a b "Fuel Cell Research Centre, Kingston, Ontario, Canada". Retrieved 31 May 2015. ^ "GeoEngineering Centre at Queen's – RMC, Home Page". Retrieved 31 May 2015. ^ "Queen's News Centre | Queen's University News Centre". Qnc.queensu.ca. Retrieved 30 June 2010. ^ "Innovation in Canada: Innovation Performance—Central Eastern Ontario". Innovation.gc.ca. 24 November 2008. Archived from the original on 24 June 2005. Retrieved 22 February 2011. ^ "Institute for Defence Resources Management – Royal Military College of Canada". Rmc.ca. 25 August 2009. Retrieved 31 October 2011. ^ "New Defence Research and Security Institute launched". Rmc.ca. 25 August 2009. Retrieved 31 October 2011. ^ "Canadian Institute for Military and Veteran Health Research (CIMVHR)". Queensu.ca. Archived from the original on 6 February 2011. Retrieved 22 February 2011. ^ "History of RMC Squadron Names". Rmcclub.ca. Archived from the original on 2 January 2009. Retrieved 22 February 2011. ^ "Admission Guidelines". Rmc.ca. 8 January 2009. Retrieved 31 October 2011. ^ Royal Military College of Canada (2 September 2008). "Royal Military College of Canada, Department of War Studies". Rmc.ca. Retrieved 22 February 2011. ^ "Strategic Research Plan – Research at the Royal Military College of Canada". Rmc.ca. 22 July 2011. Retrieved 31 October 2011. ^ "Military and Strategic Studies, Royal Military College of Canada". Rmc.ca. 8 January 2009. Retrieved 31 October 2011. ^ "Diploma in Military Arts and Sciences". Cda-acd.forces.gc.ca. 2 September 2008. Archived from the original on 6 July 2011. Retrieved 22 February 2011. ^ "Joining Instructions – First Year Officer Cadets". Rmc.ca. 17 September 2010. Retrieved 31 October 2011. ^ "The Whig Standard – Ontario, CA". Thewhig.com. 15 February 2011. Archived from the original on 9 July 2009. Retrieved 22 February 2011. ^ Royal Military College of Canada (30 January 2014). "Department of Athletics – Royal Military College of Canada". rmc.ca. Retrieved 27 September 2014. ^ "Services of the Band of the Royal Military College of Canada". Rmc.ca. 8 January 2009. Retrieved 31 October 2011. ^ "Educational Block, Royal Military College, Kingston". 13 (1). Kingston: Construction (Toronto). January 1920: 6–8. ^ "EngMarch04.qxd" (PDF). Archived from the original (PDF) on 5 June 2011. Retrieved 22 February 2011. ^ "Ontario Heritage Foundation plaque". heritagefdn.on.ca. Archived from the original on 15 June 2011. Retrieved 25 September 2016. ^ "Stone Frigate". Rmc.ca. 13 December 2010. Retrieved 31 October 2011. ^ Brock, Thomas L. (1988). "Barrie, Sir Robert". In Halpenny, Francess G (ed.). Dictionary of Canadian Biography. VII (1836–1850) (online ed.). University of Toronto Press. ^ "Stone Frigate: Ontario Heritage Trust plaque". heritagefdn.on.ca. Archived from the original on 24 May 2012. Retrieved 25 September 2016. ^ 5498 Mr. Garth M. LeFresne (RMC 1962) 'The Royal Twenty Centres: The Department of National Defense and Federal Unemployment Relief: 1932–1936' an unpublished B.A. Thesis from the Royal Military College, Kingston, 1962 which looks at the relief camps from the point of view of military efficiency. ^ a b "e-Veritas » Blog Archive » Former DCdt Marcel Parisien In Conversation With Victoria Edwards". Retrieved 31 May 2015. ^ "e-Veritas " Blog Archive " Top Headlines". Rmcclub.ca. Archived from the original on 3 January 2009. Retrieved 22 February 2011. ^ "Life at RMC". Rmc.ca. 2 December 2008. Retrieved 22 February 2011. ^ "Margin of Excellence". Rmc.ca. 8 January 2009. Retrieved 31 October 2011. ^ "Veritas". Rmcclub.ca. Archived from the original on 7 October 2011. Retrieved 31 October 2011. ^ "e-Veritas". Rmcclub.ca. Retrieved 22 February 2011. ^ "Ontario, CA". Kingston This Week. Archived from the original on 28 September 2007. Retrieved 22 February 2011. ^ "Athletics Department – Royal Military College of Canada". Rmc.ca. 8 January 2009. Retrieved 31 October 2011. ^ "Structure Number 123865". Retrieved 31 May 2015. ^ "A. Public Work Architects". Retrieved 31 May 2015. ^ "Horwood, Edgar Lewis". Retrieved 31 May 2015. ^ "Memorial Arch – 90th Anniversary". Retrieved 31 May 2015. ^ "Search – Directory of Special Collections of Research Value in Canadian Libraries". Collectionscanada.gc.ca. Retrieved 22 February 2011. ^ "e-Veritas » Blog Archive » RMCC's Future Shakespeares Honour Those Who Have Gone Before". Retrieved 31 May 2015. ^ "Defence Construction Newsletter: Protecting RMC" (PDF). Archived from the original (PDF) on 15 June 2011. Retrieved 22 February 2011. ^ a b c d e f Richard Preston 'Canada's RMC: A History of the Royal Military College of Canada' published by the RMC Club by U of Toronto Press. 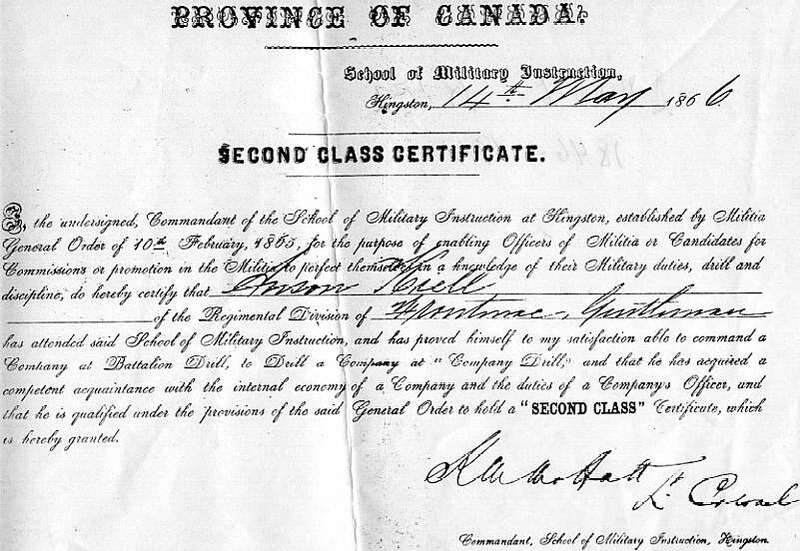 ^ "Anson Keill's Second class certificate from the School of Military Instruction, Kingston". Archived from the original on 7 April 2016. Retrieved 7 June 2016. ^ "The Royal Military College of Canada: Memorial 35036-009 Kingston, ON". National Inventory of Canadian Military Memorials. Veterans Affairs Canada. Retrieved 30 December 2016. ^ The Origins of the College Motto and Cap Badge By #8057 Ross McKenzie, Curator RMC Museum Archived 2012-02-28 at the Wayback Machine Extract from the Royal Engineer Journal, 1 April 1878, p.29. ^ "Officer Cadet Dress Uniform". Rmc.ca. 8 January 2009. Archived from the original on 10 September 2012. Retrieved 31 October 2011. ^ "The Project Gutenberg EBook #6466 of 'The Intellectual Development of the Canadian People, A historical review' by John George Bourinot, House of Commons, Ottawa, February 17th, 1881". Gutenberg.org. 1 September 2004. Retrieved 22 February 2011. ^ Barry Taylor. "Can You Tell Me The Reason Why?". Members.shaw.ca. Retrieved 22 February 2011. ^ "R.M.C. march & two step". Collectionscanada.gc.ca. 31 March 2004. Archived from the original on 25 November 2007. Retrieved 22 February 2011. ^ a b "Royal Military College of Canada – Review Yearbook (Kingston, Ontario Canada)". Retrieved 31 May 2015. ^ swellal@hotmail.com. "Nan mascot of Princess of Wales' Own Regiment". 21stbattalion.ca. Retrieved 22 February 2011. ^ "Canada's RMC: A History of the Royal Military College" Preston pp 396/7. ^ "'Army Relief Projects'". Data4.archives.ca. Archived from the original on 18 October 2015. Retrieved 22 February 2011. ^ "RMC March". Rmc.ca. 8 January 2009. Retrieved 31 October 2011. ^ "Canadian Forces Administrative Order 32-3 Marches of the Canadian Forces". My.tbaytel.net. Archived from the original on 16 July 2011. Retrieved 22 February 2011. ^ "e-Veritas " Blog Archive " Flashback | Rétrospective". Rmcclub.ca. Archived from the original on 3 January 2009. Retrieved 22 February 2011. ^ "March for Bagpipes". Rmc.ca. 8 January 2009. Retrieved 31 October 2011. ^ Richard A Preston, Canada's RMC. ^ "RMC Submarine" (PDF). Archived from the original (PDF) on 15 July 2011. Retrieved 22 February 2011. ^ Richard A. Preston Revised: Laura Neilson. "Royal Military College of Canada". Thecanadianencyclopedia.com. Retrieved 22 February 2011. ^ "Home – RMC Foundation of Canada". Archived from the original on 13 April 2004. Retrieved 31 May 2015. ^ Preston, Richard A. (1991). To Serve Canada: A History of the Royal Military College of Canada. University of Ottawa Press. ISBN 978-0776603278. ^ philcovex. "Postal History Corner". Retrieved 31 May 2015. ^ Don McIver Design www.donmciverdesign.com. "Commemorative Stamps". Westvan60.com. Archived from the original on 18 July 2011. Retrieved 22 February 2011. ^ "Item # 1036550 – Canadian Postmasters Association Medallic First Day Cover 1976 Commemorative Issue No. 7". Retrieved 31 May 2015. ^ "The Public Register of Arms, Flags and Badges of Canada". Retrieved 31 May 2015. ^ "Canadian War Museum" (PDF) (in French). Retrieved 22 February 2011. ^ "Queen`s Colour (flag)". Archive.gg.ca. 28 July 2005. Retrieved 22 February 2011. ^ "Regimental Colour (flag)". Archive.gg.ca. 28 July 2005. Retrieved 22 February 2011. ^ "NFB – Collection – The Royal Military College of Canada – A History". Nfb.ca. Retrieved 22 February 2011. ^ George Frederick Cameron. "Leo the Royal Cadet". Openlibrary.org. Retrieved 22 February 2011. ^ "Studies in Canadian Literature". Lib.unb.ca. 21 June 1909. Retrieved 22 February 2011. W.A. Boutin, "Arts versus engineering: the Royal Military College dilemma" Toronto: Canadian Forces College, 1997 Call 355.005 C3. G1397 Major Andrew Godefroy CD, PhD, plsc Professional Training put to the test: the Royal Military College of Canada and Army Leadership in the South African War 1899–1902 The Army Doctrine and Training Bulletin Vol.6 No.2 (Summer 2003). Adrian Preston "The Founding of the Royal Military College: Gleanings from the Royal Archives." Queen's Quarterly 74, no. 3 (Autumn 1967). Adrian Preston "The Founding of the Royal Military College" Ottawa: Canadian Forces. No 155. Mayor George N. Speal The Freedom of the City of Kingston for the Royal Military College of Canada Publication of the Kingston Historical Society. Vol. 25. 1977. Walter S. Avis: "Essays and articles selected from a quarter century of scholarship at the Royal Military College of Canada, Kingston" (Occasional papers of the Department of English, R.M.C.) 1978. 2141 Thomas Leigh Brock (RMC 1930) "Fight the good fight: Looking in on the recruit class at the Royal Military College of Canada during a week in February 1931" (private printing), Victoria, 1964. H16511 Dr. Richard Preston "R.M.C. and Kingston: The effect of imperial and military influences on a Canadian community" 1968. H1877 R. Guy C. Smith (editor) "As You Were! Ex-Cadets Remember". In 2 Volumes. Volume I: 1876–1918. Volume II: 1919–1984. Royal Military College. [Kingston]. The R.M.C. Club of Canada. 1984. Alfred George Godfrey Würtele "Not In Cooke. – Account of a tour by the first graduating class of the Royal Military College", Kingston, 1880. Ernest F. Würtele Royal Military College Club of Canada. Reference book containing information respecting the graduates, ex-cadets and gentleman cadets of the Royal Military College of Canada: Privately printed, 1892. Reproduced in microform CIHM microfiche no. 14751. "To Serve Canada: A History of the Royal Military College since the Second World War", Ottawa, University of Ottawa Press, 1991. Yves Tremblay "L'education et les militaires canadiens" Outremont, Quebec Athena Editions, 2002. "The Royal Military College of Canada 1876 to 1919"
"A university with a difference: Royal Military College of Canada" Ottawa: Canada Department of National Defence, 1994. Royal Military College of Canada, Fort Frederick: Facts brochure, (Kingston, 2000). Royal Military College of Canada, Visit Fort Frederick and the Royal Military College of Canada Museum brochure, (Kingston, 2000). For a more comprehensive list, see Bibliography of Canadian military history. Wikimedia Commons has media related to Royal Military College of Canada.